GB: Can you give us a summary of what to expect with Watcher's Keep? You've stated that this dungeon is going to be the best ever implemented into any of the Infinity Engine games. What exactly gives Watcher's Keep such a title? Doug: Watcher's Keep is the dungeon that we're adding that can be played during Baldur's Gate II: Shadows of Amn or during Throne of Bhaal. It is going to be even more exciting than Durlag's Tower in Tales of the Sword Coast. Players will come face to face with an ancient evil of truly terrible power and have to deduce how it can best be overcome. Along the way, they will encounter artifacts, demonic creatures and even battle the elements in trials that are both physical and mental in nature. To answer your question, expect to be challenged. GB: Will characters who begin the expansion with maximum experience, spells, and items have much difficulty with the expansion? For instance, even though HoW offered the (Heart of Fury) mode, many people played through at normal difficulty and finished the expansion in less than 10 hours. How do you plan on keeping powerful characters from finishing the expansion too early? Also, how are you planning to handle players that have used an experience cap remover on their character and then try to import them into Throne of Bhaal? Doug: We are anticipating character levels that are incredibly powerful. With that in mind, we have come up with some rather diabolical challenges for our players. We can also control when players encounter which enemies via story so that they will always be challenged. As we did in BG2, we can also have encounters adjust for the aggregate level of a player's group so that more enemies spawn in based upon the toughness of the party. As for people that removed their XP cap, we do not support that in any way, shape or form so if they want to be challenged in Throne of Bhaal, they should take that into account. GB: After finishing BG2, many players are wielding some of the most powerful equipment ever implemented into an AD&D CRPG to date. What sort of equipment do you plan on adding that will be better (or even compare) to what people already have? For example, it will be difficult to match weapons such as Blackrazor or Crom Faeyr. Doug: Have no fear, many of the new items will make even those weapons seem weak by comparison. Many of the new and more powerful weapons have effects that trigger after a successful hit. An example of this would be a Longsword that casts a Fireball after you hit a creature with it. Overall, I believe there are around one hundred new items to find and wreak havoc with. GB: How many new spells are you planning to add in the expansion? Will most of the new spells be available only to Wild Mages, or will all casters receive some? Also, will melee classes obtain new high level abilities/enhancements as well? Doug: We are adding 9th level Mage spells to the game, and yes, Wish will be included. We are also adding new Priest spells. The really impressive new additions are the high-level abilities. With these your fighter can become a whirlwind of death, your mage can cast more spells, your cleric can summon an avatar of his faith and your rogue can set really nasty traps. Every class is going to have a great selection of abilities and many of them have prerequisites (sort of like the Feats in 3E Dungeons and Dragons®). GB: Heart of Winter brought Icewind Dale a variety of enhancements, such as higher resolution settings, more details during combat (amount of damage resisted, etc), and the Heart of Fury mode. 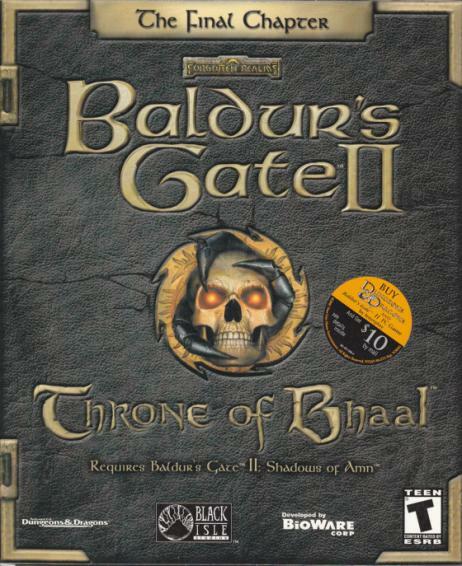 Aside from new equipment, spells, and monsters, what enhancements can we expect to see to the original Baldur's Gate II after installing Throne of Bhaal? Will some of these enhancements only be available to those who play BG2 from the beginning again (such as new equipment at NPC merchants)? Doug: There will be noticeable differences between Baldur's Gate II: Shadows of Amn and Throne of Bhaal. We are changing the music in the game by adding new theme music and area music for the new areas. We are also increasing multi-player stability, which will make multi-player even more enjoyable. We will be modifying some of the items from Baldur's Gate II: Shadows of Amn in Throne of Bhaal and making them even more powerful. We are also adding a whole slew of new items that players can find and create. We will also be including the option to show character movement on the world map. This will make it much easier to keep tabs on your characters as they make long journeys.